Wisconsin is just one year away from implementation of a statewide smoking ban and smokers will start paying even more for cigarettes in September. Dr. Michael Fiore with the UW Center for Tobacco Research and Intervention says those factors will likely encourage many people to quit for good, so they can save money or don&apos;t have to deal with the inconvenience of not being able to smoke in a tavern. However, smokers looking to kick the habit may have trouble getting help. The state budget increases the per pack cigarette tax by 75 cents, resulting in $700 million in excise taxes for the state each year. But the budget also cut back on funding tobacco prevention and intervention programs. Fiore says smokers are being asked to help the state remain solvent while addicted to a drug, and we need to provide them with the resources to break free. 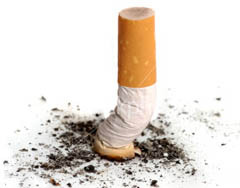 The state budget allocates about $6.8 million towards tobacco programs. Fiore says at least five million of that needs to go towards programs designed to help people quit. Meanwhile, Fiore says the Wisconsin Tobacco Quit Line is ready to help smokers kick the habit well before the tax hike or statewide ban go into effect. It can be reached by calling 1-800-QUIT-NOW (784-8669).